I know its been a while, but I’ve been hard at it. Finding new places (old) to hunt has slowed down. Here lately I’ve been back to places I’ve hunted hard and probably just about everyone else has too. I’ve managed to pull a Merc and a War nickel out of one hole and found several wheats. I hunted one old property that was just a bear to hunt. Signals were erratic, unrecognizable and ended up providing the old dime and nickel. I’ve just about completed the old park and its only giving up a few wheats. So now it’s back to research and coming up with road trips to find new ground to hunt. I can always start knocking on doors, but you run the chance of being misled and end up hunting a rental property which can turn into problems. Hopefully my next post will be more exciting! I hit my goal of 30 silver coins plus 1. A year ago I wouldn’t have thought it possible. Now I’m curious to see how many I can hit in a year! 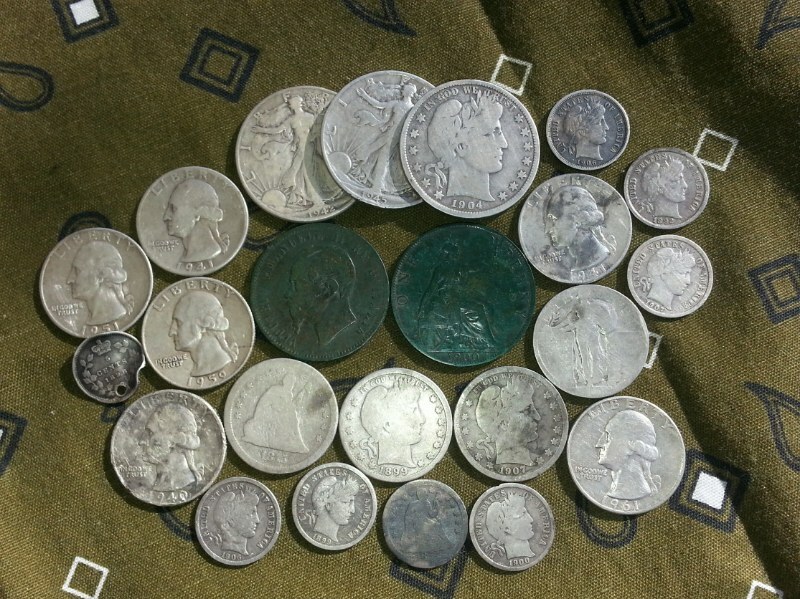 If you think about the billions (I think possible) of silver coins made over the years. I think it’s possible for 25% of them to be in the ground, right? Its crazy to think how many has been found by us dirt hounds over the years. I can remember when finding coin spills was the big thrill until I started hitting silver. Tonight I hit a coin spill of 3 clad quarters and a clad dime. It was nice, but not as nice as silver. I can imagine the headline in my local paper, “Local man found dead metal detecting after finding gold coin.” That would be me, just the thought of finding a gold coin gives me the chills. I know when I pulled that 1887 presidential coin out of the ground, I started shaking as I cleaned it since it looked like a gold coin. I couldn’t get it cleaned fast enough! It wasn’t gold, but its still cool. I hope everyone else is hitting their goals, if not, stay at it. I live in one of the most heavily detected cities in Missouri (just go look at all the metal detecting clubs), but they haven’t found it all!